As District of Calamity marks its third anniversary, it seems right to reflect upon its methods and message. One of the prominent features of this site are aphorisms. This is deliberate to have daily, pithy memes which can be inspiring, provocative or entertaining. What was originally intended as an impetus to post every day evolved into a feature which gives short yet thought-filled memes. While DistrictofCalamity.com is oriented towards politics, not all wisdom of the world is drawn from the Federal City. This site revels in public policy analysis which is intended to last longer than the average politician’s promises, so it should not be locked into quotidian Capital Hill struggles. Rather than just list texts which make eyes glaze over, District of Calamity pairs the pearl of wisdom with a narrative graphic. Often the graphic depicts the originator of the phrase so readers can match the meme to a person. But illustrating the gist of the quote can also be effective. Some readers have challenged the use of quotes. After posting a quote attributed to Soren Kirkegaard, the interlocutor demanded “Are you a REAL Kieregaard scholar? If so, cite chapter and verse to the origins of the quote.” Well dear reader, the answer is no but not that it matters. District of Calamity posts over 300 daily quotes a year. Rarely are memes simply cut and pasted from other sites. The Pearls of Wisdom project is a labor of love which encompasses an eclectic range of art, history, literature, philosophy, politics, pop culture and humor. However, it takes time to locate, create, arrange and publicize an alluvia of aphorisms, particularly without repetition. Regular readers may notice that quotes are often correlated to the calendar, reflecting anniversaries, issues of the day and times of the season. In addition, strings of quotes may project a larger theme pointing to issues which impact the District of Calamity (sic). 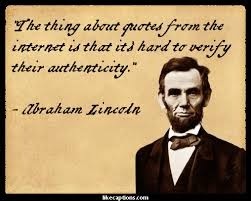 When a saying sounds shaky or too good to be true, some effort is made to corroborate the quote, but it is not always a scholarly citation. So for the Kierkegaard question, consider the site’s quotes to be as reliable as Wikipedia. It may be inspiring and even informative but you need to do your own homework to be certain before putting it in your dissertation. Some critics have claimed that quotes are taken out of context, such as Bobby Jindal on immigration and assimilation. This critique was comical as a 55 minute video of the speech in question was also embedded in the post. It is dubious if the progressive protestor spent the same time appreciating the quote in context before pulling out the proverbial poison pen. But even when chapter and verse can be given, it is not usually included lest a meme look like a pharmaceutical disclaimer chyron or the credit roll for Bambi Meets Godzilla. A reader recently claimed that a quote about society from Cal Thomas was confusing because it could mean anything. Well, knowing who said something can be illuminating. If the reader knows who Cal Thomas is, then the prescriptions for fixing society would be quite clear. Nevertheless, the gist of the aphorism that our leaders are a reflection of societal values is valid without that insight. Another website visitor was agitated about a piece about bigotry by George Bernard Shaw. The reader offered an unsolicited education about Shaw’s social sins. In this instance, the source of the quotation was provocative and intentionally ironic considering Shaw’s Faustian socialistic foundation-- however the truth of the aphorism was indubitable. The internet can be a conduit of thoughtful two way communication. So if readers can correct a mis-attributed meme, it is appreciated and may be incorporated as warranted. Unfortunately, contributors have demanded corrections which were not warranted and perseverated. For example, a graphic countered the claim that Ted Cruz knew nothing about a Second Amendment case. Cruz was associated with arguing the Heller case before the Supreme Court, when in actuality he had only offered an amicus brief. The mis-attribution was noted and credit was given, but the correction did not moot the gist of the post so it was not withdrawn. But that was not satisfactory to the correspondent, who harbored a hatred for the politician. While it is hoped that you will be inspired and intellectually stimulated by aphorisms, if you question the authenticity, please offer gentle correction with affirmative information if necessary. Feedback can be useful and is often incorporated without fanfare. In the end, if a reader finds that one's charitable contribution is unsatisfactory, then please seek truth where you can find it.